ATLANTA – March 7, 2016 — Admiral Capital Group (“Admiral”) and McCann Realty Partners (“McCann”) announced the acquisition of Howell Bridge Apartments, a 256-home community located in Duluth, GA. The property represents Admiral’s third investment in the Atlanta MSA and its first joint venture with McCann. 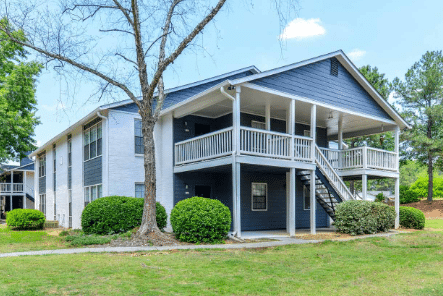 Built in 1985, the two-story garden-style property is located on Peachtree Industrial Boulevard, providing excellent visibility and immediate access to one of the main thoroughfares in the northern Atlanta suburbs. Howell Bridge’s generous floorplans across 32 acres offer prospective tenants an unparalleled spacious living community with direct proximity to numerous retail destinations, including Whole Foods, Target, Home Depot, and Starbucks. The property will be managed by Atlanta based Pegasus Residential, LLC. The multi-faceted value creation opportunity was one of the primary reasons the venture viewed the acquisition as compelling. Admiral and McCann’s business plan is focused on three value enhancement drivers: invest significant capital to repair deferred maintenance, upgrade the original 1985 unit interiors and amenities, and institutionalize the property management. “The suburban Atlanta apartment market continues to have strong rent growth due to job creation. Repositioning the property by upgrading the exterior appearance, amenities, and unit interiors will allow us to provide a more positive experience for residents while increasing the value of the property,” said McCann’s Vice President of Acquisitions, Thomas Upson. Admiral Capital Group was founded by David Robinson, philanthropist and NBA Hall of Famer, and Daniel Bassichis, formerly of Goldman Sachs, to invest in real estate and private equity opportunities. Admiral, in partnership with USAA Real Estate Company acquires value-add office, multifamily, hospitality and retail properties valued between $20 million and $70 million in major U.S markets. The Admiral founders have pledged 10% of their profits to philanthropic causes in areas where Admiral invests, building on Robinson’s lifetime commitment to support education and lower income communities. For more information, visit www.admiralcg.com. Headquartered in Richmond, Virginia with offices in Houston, Texas, McCann Realty Partners (“MRP”) is a real estate investment and operating company that specializes in the acquisition, development and management of multifamily communities in the Southeast, Southwest, Mid-Atlantic and adjacent regions. Since inception, MRP has acquired 26 apartment communities totaling more than 6,750 homes in transactions valued at approximately $615 million. MRP has also completed or has under development 9 communities totaling 2,688 homes with an estimated completed value of $350 million. For more information, visit www.mrpapts.com.